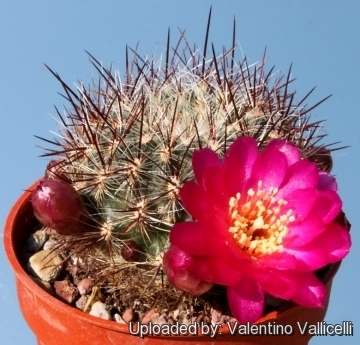 Accepted Scientific Name: Rebutia steinbachii Werderm. Sulcorebutia steinbachii f. bicolorispina Photo by: Andrea B. Origin and Habitat: North and east of Cochabamba in the Cordillera de Cochabamba, in southern Bolivia. Habitat: Grows mainly on a flat, dry, stony areas. Rebutia steinbachii f. cristata hort. Sulcorebutia steinbachii f. cristata hort. Sulcorebutia augustinii f. cristata hort. Rebutia cochabambina var. clizensis hort. Sulcorebutia hoffmanniana var. clizensis hort. Sulcorebutia kruegeri var. cochabambina f. clizensis hort. 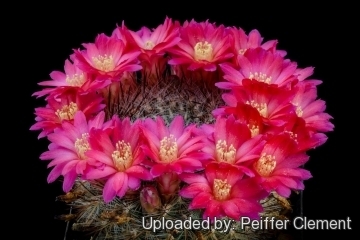 Sulcorebutia steinbachii subs. cochabambina var. clizensis hort. Sulcorebutia hoffmanniana var. cochabambina hort. Sulcorebutia tiraquensis var. electracantha Backeb. Sulcorebutia oenantha var. Epizana hort. Sulcorebutia steinbachii var. Epizana hort. Sulcorebutia markusii var. longispina Rausch, n.n. Sulcorebutia steinbachii cv. Bicolor hort. 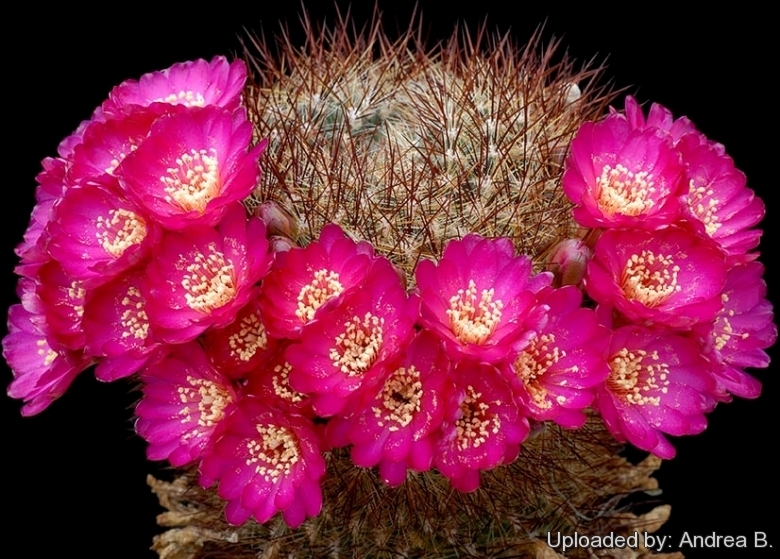 Description: Sulcorebutia tiraquensis var. 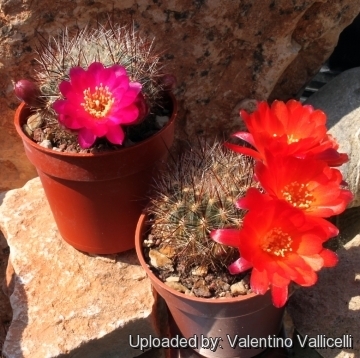 bicolorispina is one of the innumerable local form of the very variable Rebutia steinbachii (= Sulcorebutia steinbachii). Its stems are almost completely concealed by fine silvery white and dark-reddish or mahogany coloured spines. Habit: It is a clustering species (rarely solitary) readily forming, especially in cultivation, clumps of many heads. Root: Mostly non-succulent, fibrous roots. Stem: Soft globular, flattened and somehow apically depressed, greysh-green to dark green sometime very dark magenta-green. Ribs: 12-26, spiralling, forming oblong rhomboid tubercles with well-defined grooves. Areoles: Elongated with short grey felt (almost naked) 3-6 long, 1,5-2 mm large. Spines: Erect, thin, bristle-like and flexible, bicoloured silvery white and dark-reddish or mahogany with darker tips. Flowers: Rarely more than 3,5 cm long and 4,5 in diameter. Bright pink to light purple, numerous in a ring at the base of the plant. Blooming season: April-May and remain open for up to five days. 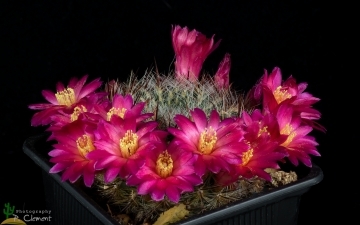 Rebutia polymorpha Cárdenas: (Sulcorebutia) It has been named polymorpha (which means "many forms") for the variability of the plant in habitat. It has white, yellow, brown or almost black spines that are frequently absent on new areoles at plant apex. Distribution: Cochabamba. Rebutia steinbachii Werderm. : (Sulcorebutia) It is a very variable clumping species (rarely solitary). Plants are often dimorphic: short spined juvenile forms transform at maturity to strongly spined forms. Some of these juvenile forms, however, may persist without transformation to the mature form. Rebutia steinbachii f. cristata hort. : crested form. There are several crested clones often very different one to each other. 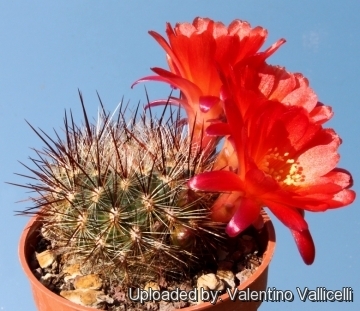 Rebutia steinbachii subv. aguilari Gertel: (Sulcorebutia) Plants with attractive mahogany red spines, dark purple budies and rings of light purple flowers in spring. Rebutia steinbachii subs. tiraquensis (Cárdenas) D.R.Hunt: (Sulcorebutia) The stems are almost completely concealed by fine variously coloured spines. Distribution: North and east of Cochabamba. Rebutia steinbachii subs. verticillacantha (F.Ritter) Donald ex D.R.Hunt: (Sulcorebutia) has 13-21 spiraling ribs, no central spines, and 12-14 pectinate radials. Distribution: Arque, Cochabamba. 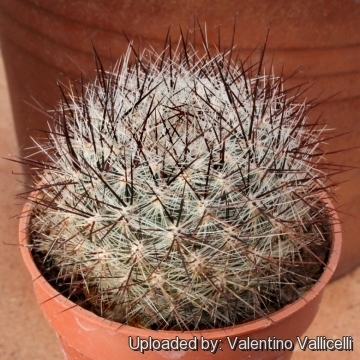 Rebutia taratensis Cárdenas: (Sulcorebutia) Tiny plant, clustering from carrot-like tap-roots readily forming small clumps of many heads. Stems dark green to purplish. Flowers magenta-red. Sulcorebutia augustinii Hentzschel: has mini stems almost hidden under the dense covering of tiny amber and pectinate spines. Rings of light purple flowers brighten up the plant in spring. Distribution: Pasorapa (Villa Redención Pampa Zudañez) Cochabamba. Sulcorebutia augustinii f. cristata hort. 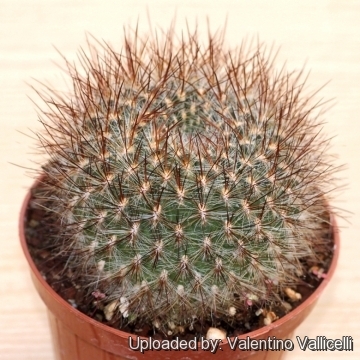 : Beautiful crested form with nice amber-honey pectinated spines, very attractive even without flowers. Sulcorebutia cochabambina Rausch: has pinkish to dark magenta flowers (occasionally with yellow throat) and clustering dull green bodies. Distribution: Arani, Cochabamba. Sulcorebutia heinzii Halda, Heřtus & Horáček: has very dark mauve-blue body, pectinated spines and shining deep magenta flowers, in age forms clusters or cushions. Distribution: Siles, (Road Totora-Omereque) Cochabamba. Sulcorebutia mizquensis Rausch: has dark green stems, white or brownish pectinated spines, pointing diagonally and downward. Flowers pink-violet or magenta. Distribution: near Mizque, Cochabamba. 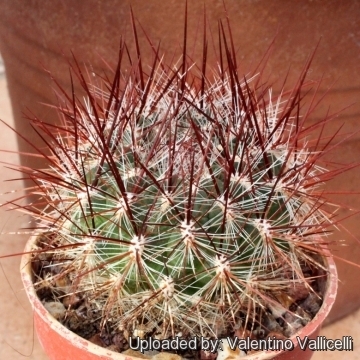 Sulcorebutia steinbachii f. bicolorispina Gertel: Silver and black spines, hence the name. Purple flowers. Sulcorebutia steinbachii var. horrida Rausch: has strong dark brown protruding spines and tanned green or bluish-black bodies. Readily forms clusters or cushions up to 30 cm (or more) in diameter. Distribution: Vacas, Cochabamba. Sulcorebutia taratensis var. minima Rausch: has minuscule bodies which cluster like a mad, readily forming crowded mounds or cushions with hundred of heads. The flowers are bright purple. Anzaldo to Sacabamba, Cochabamba, Bolivia. * S. hoffmannianaS. glanduliflora Card. n.n. Group 1b: Province Tiraque to Epizana an eastward to Comarapa, 2,800 m-3.000 m.
Cultivation and Propagation: This species loves a very permeable, coarse mineral soil as well as to be strictly kept dry throughout the winter quiescent period since it is very sensitive to any moisture excesses, To prevent rottenness it is also advisable to surround its root neck by very rough sand or grit, this help a fast water drainage and an appropriate air circulation. Watering Needs: Water moderately in the growing season, keep dry during the winter rest. Frost Tolerance: Plants are quite frost hardy -5 (-10)° C. Overwinter in a cool place (at 0/10°C) this is important for the flowers as well as for plants health. Without this cool winter period they normally wont get any buds. Sun Exposure: Needs a full sun exposure ( light shadow my be useful in the hottest summer days).